Because my flight to Rome was out of the Munich airport, I decided to go a few days early so I could actually travel before classes started and also see a bit of Munich. It was my first time ever legitimately traveling alone, and I was kind of worried that it would be depressing or boring, but it really wasn’t. Since I was by myself, I got to do exactly what I wanted, when I wanted, without worrying about compromising with other people. That’s kind of nice sometimes. The trip started off auspiciously… I got all these cute little notebooks from my Aunt Mary Beth, and I’d been collecting trip information in one of them… train times, flight information, names of hotels, phone numbers, and so on. But somehow, on my way to the train station, I dropped it. So I was delayed for an hour since I had to go back to my dorm, get all the information again, and take the next train to Munich. Luckily, that was the biggest thing I’ve lost yet since I got to Europe. Knowing me, that’s pretty fortunate. I really love taking trains. I think they’re so much better than planes… much more comfortable, although they take a lot longer. It’s a good opportunity to listen to music and relax and just let my mind wander. The journey to Munich takes a little over 4 hours, so by the time I got there, I was SUPER hungry, even though it was a little early for dinner. 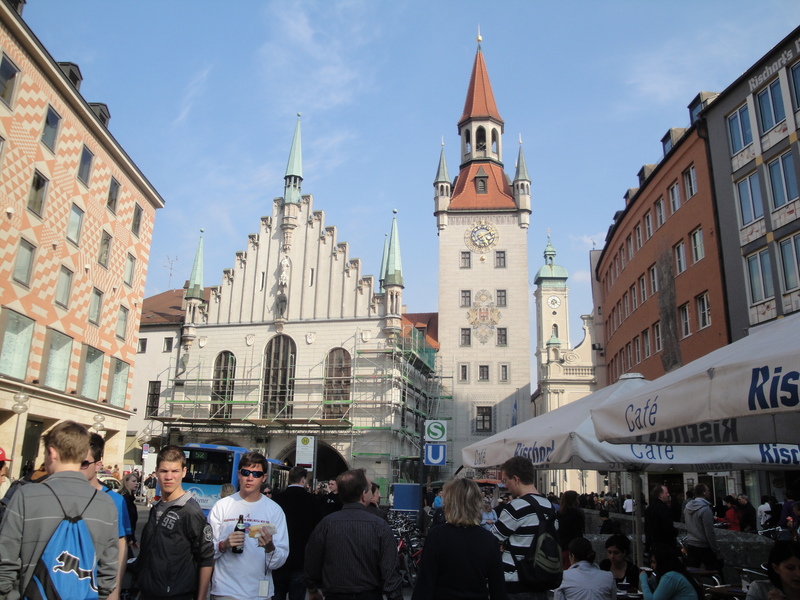 I walked over to the Frauenkirche, Munich’s cathedral, because I had picked out a biergarten very close to the church. The food was really good–it was actually my first time trying schnitzel, and it was delicious. And of course I am always a fan of potato salad. But what I really remember about that meal, unfortunately, is that my waiter was really rude. He refused to speak to me in German, and when it came time to pay him, he gave me 50 cents less change than he owed me. When I asked him about it, he responded that it was just the tip. If it had been more than 50 cents, I probably would have told him that no, I am not a stupid tourist, and yes, I do know that tips don’t exist in Germany. Anyway. The food was good, the service was not. 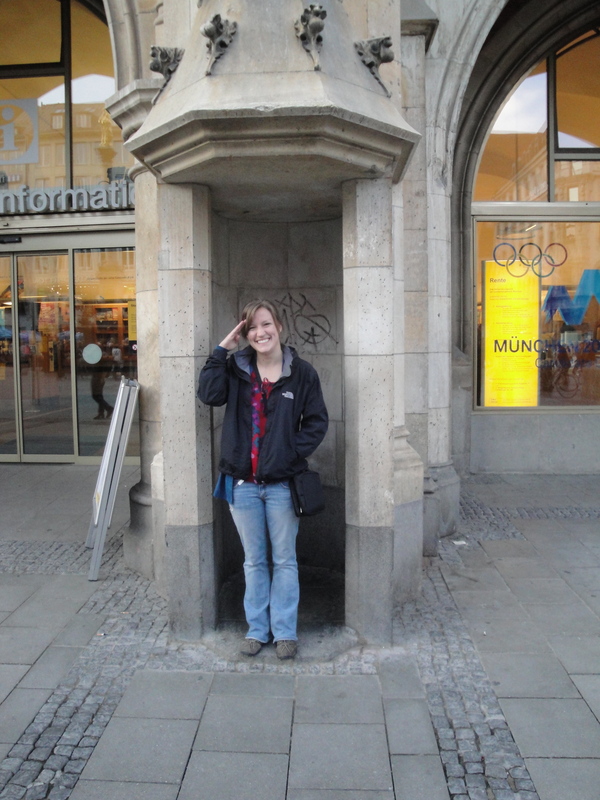 Then, I went on a (self-guided) walking tour all around Munich. I spent some time praying in the Frauenkirche and then walked over to the Marienplatz, the crossing of 4 major streets. The Marienplatz is pretty intense… there are really big, important, old buildings every way you turn, lots of street vendors, and lots of traffic (of both the vehicle and people varieties). From there, I went to the Viktualenmarkt, a big market with everything from sausage and sandwich vendors to legit butchers to merchants selling little nicknacks. Here's a view from Marienplatz! If you pay close attention, you'll notice the lack of the open container law in Germany. It's kind of funny to see people just walking around drinking beer. From there, I continued on to see the (outsides of ) the New Synagogue, Jewish History Museum, and Munich City Museum. I enjoyed reading the quotes on the outside of the Jewish History Museum. I thought they did a good job with the selection and assortment… they ranged from interviews with Holocaust survivors to light-hearted anecdotes about being Jewish in Germany to stories of the immense pain and suffering that have taken place in the last century. The rest of my walking tour included lots of luxury… first, this really fancy Rococo-style church that was built by Munich architects more as a business card than a place of worship: they included every possible Rococo decoration to showcase their skills to clients who might want to hire them. That was really interesting. Then I made my way to the Residenz area of the city. The Residenz is the old palace of the Wittelsbachs, the elector-duke’s family/dynasty who ruled in Bavaria for several hundreds of years until the 19th century. They were really extravagant people… that area of the city included the huge Residenz palace, which is right next to the city theater (which I didn’t go into, but I hear it’s super plush inside) and a bunch of other Wittelsbach buildings… their family church, several monuments to members of their family and military heroes, and the extravagant Hofgarten that’s behind the Residenz. This area of the city really reminded me of Paris. Which makes sense, because the Wittelsbachs planned the city based on models such as Hapsbourg Vienna and Napoleonic Paris. One really interesting thing about this section of the city (and all of Munich in general) is that these buildings aren’t the originals. The whole city was more or less destroyed during the war and these are all restorations. By this point, I was dead tired, so I made my way back to my hotel (on the way buying special edition SETTLERS OF CATAN Rittersport chocolate. Be still, my nerdy heart) and watched a CNN report of the Royal Wedding. It was the only channel I could find in English, don’t judge. My favorite room was definitely the Antiquarium, this huge banquet hall (that is still sometimes used for banquets!) that includes the Wittelsbach family’s collections of Roman busts and expensive porcelain AND some of the only frescoes that survived WWII: old depictions of the towns of Bavaria from the middle ages. They survived since they are painted in the arches of the windows. It was really interesting to see how Munich would have looked hundreds of years ago, as well as other towns, like Dachau. That one was pretty striking. 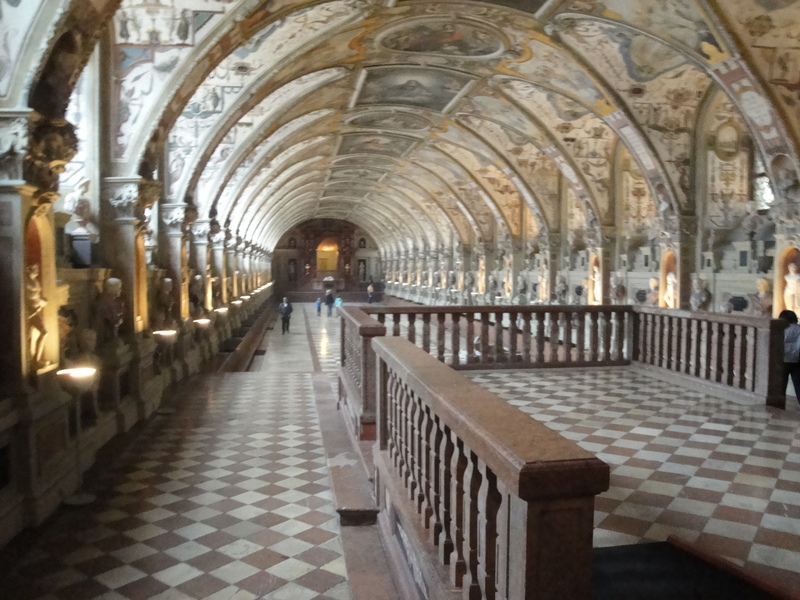 The whole time I was in the Antiquarium, I really wanted to leap and dance around the room singing “Once Upon a December” from Anastasia, since it really looked like the hall that Anastasia visits in St. Petersburg that sparks memories of her royal past. I know it’s not historically accurate, but it would have been awesome. By the end of the museum, I was seriously a mess. My feet hurt something fierce, and I really only visited the second half of the museum (the Treasury, which actually ended up being pretty cool) because I had already paid for it. But I desperately needed something to eat. So I trudged my aching feet across town to the Viktualsmarkt and bought a bratwurst and some ice cream and rested before I headed into the Munich City Museum, the next item on my agenda. I know, I know, so many museums, but it basically rained all day, so it ended up being a stellar plan. Honestly, I was kind of miserable in the City Museum. Don’t get me wrong… I thought it was so interesting. I wish I had been a better sport about it. But in my defense, my feet really did hurt, I was wet and cold, and everything was in German… which, you know, takes a bit more brain power. But nevertheless, I did enjoy myself. The main exhibit, “Typisch München,” is 5 floors detailing the history of Munich, from its founding by monks (hence its name!) about 1000 years ago, about which there are very few facts but many legends, until the Olympics in the 70’s and beyond. It was kind of awesome… through telling the story of Munich, they addressed so many of the stereotypes–the “beer hall beauties,” the reputation of Munich as the capital of art and beer (which was actually the official motto of Munich for quite some time), and the role of the city in Hitler’s Nazi regime–most of which are very firmly rooted in fact. One thing I’d say, though, if you’ve never been to Germany, is don’t let these stereotypes inform your perception of Germany as a whole. They are very Bavarian and especially specific to Munich. I had planned on going for dinner at a beer garden a little bit outside of the city center, but it was raining so I didn’t think that sounded very appealing anymore. I instead headed to a restaurant in a really old building that served typical Bavarian cuisine and local beer. It was delicious (and warm… I did not pack very appropriately for this trip so I was cold most of my time in Munich)… I chickened out on the local cuisine and got Wiener Würstle (Vienna sausages) which are basically like hot dogs… but like ten thousand times better! Plus they came with potato salad. Always a plus. (Anyone reading this who doesn’t know me is going to think I’m a blimp. Nope, I just love potatoes like no other.) The beer was really good, too! This time, the waitress didn’t con me out of money or talk down to me. This is where the royal guards used to stand. Also, notice the Olympic rings in the background... Munich is hoping to get the bid for 2018! I really enjoyed having a buddy to see the city with! We walked through the Hofbräuhaus, which I had seen the day before on my walking tour, but it’s really lame to walk through such a cheesy, happy place by yourself. Sigi pointed out all the dumb tourist things to me and even took a picture of me in front of the polka band! It’s thanks to him that there is actual photographic proof that I went on this trip. Overall, it was a really nice surprise to be able to experience the city with my new friend. He gave me his business card, so if I’m ever in Munich again, I’ll have to give him a call! 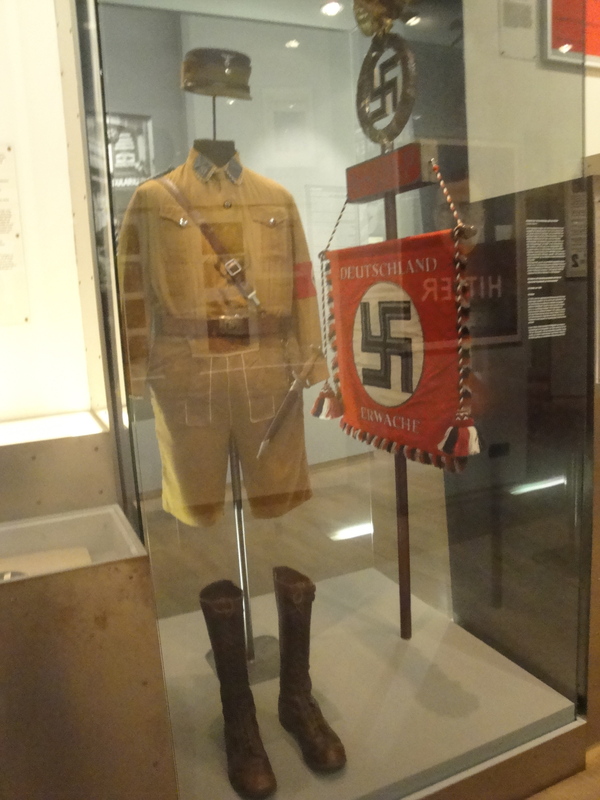 Overall, I really did like Munich. Some of it reminded me of a combination of Lucerne and Paris, but something about Munich is unique. One blessing, I think, is that I came away from this part of my trip completely affirmed in my choice of Freiburg for the semester. As much as I liked Munich, Freiburg is cleaner, cheaper, smaller, and less touristy. Stay tuned for further details of my trip. Up next: Perugia! oh,and…I just HAD to look up Atlanta’s sister cities (all 18 of them). Some to note are Toulouse (yay France! ), Brussels, Nuremburg, Salzburg (how about that? two in Germany!) and Ancient Olympia! More interesting than I thought…. Chicago has 28! The best one? PARIS! That’s how we roll! 2. Chicago would be awesome enough to be partnered with Paris! That’s awesome! ohmygoodness that’s so awesome that you made a friend to walk around with!! for some reason it reminds me of all those old MK&A Olsen movies, and they always find cute boys and I was always jealous. even though this was obviously different. and trains are awesome! My family LOVES trains. We ride on one pretty much any time we take a trip somewhere. You get to take in so much more of the country that way!